Here are a couple of other things I've been working on while I was away. I started When Thou Art Rich by Hands Across the Sea Smplers. I had the good fortune of seeing the antique while I was at Sassy Jacks in January 2018. 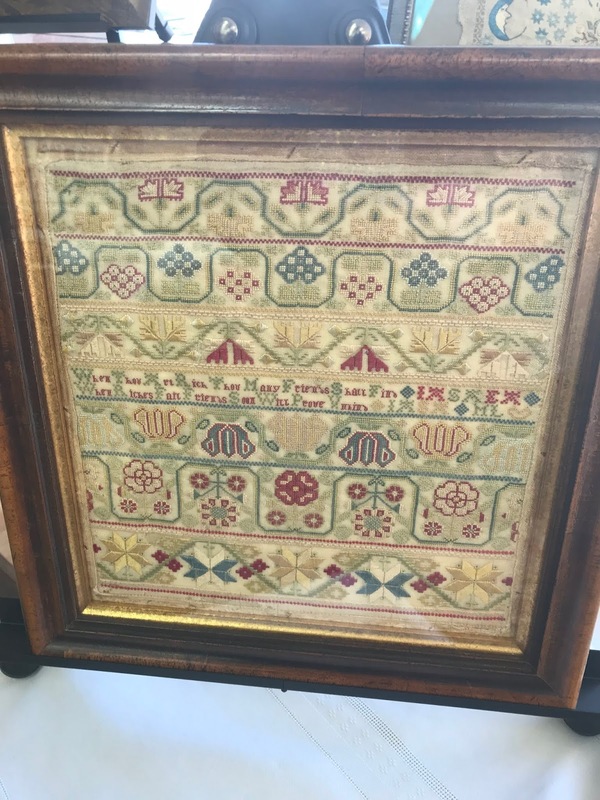 Such a beautiful sampler. I've LOVED stitching what I have stitched so far. The next row, however, is a row of queen stitches and I'm honestly not sure how I'm going to get through that. 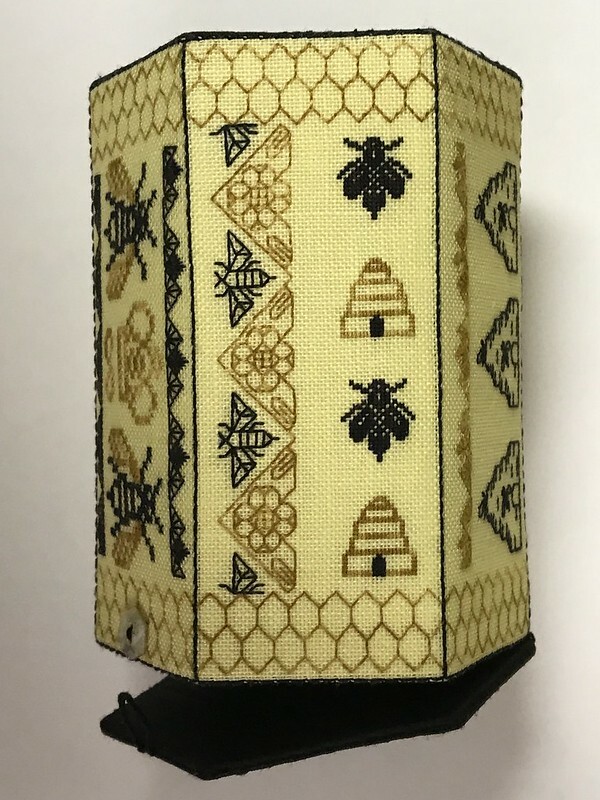 The queen stitches are over 4 on 40 count and are the light yellow so not a good thread color to really see what you are doing. 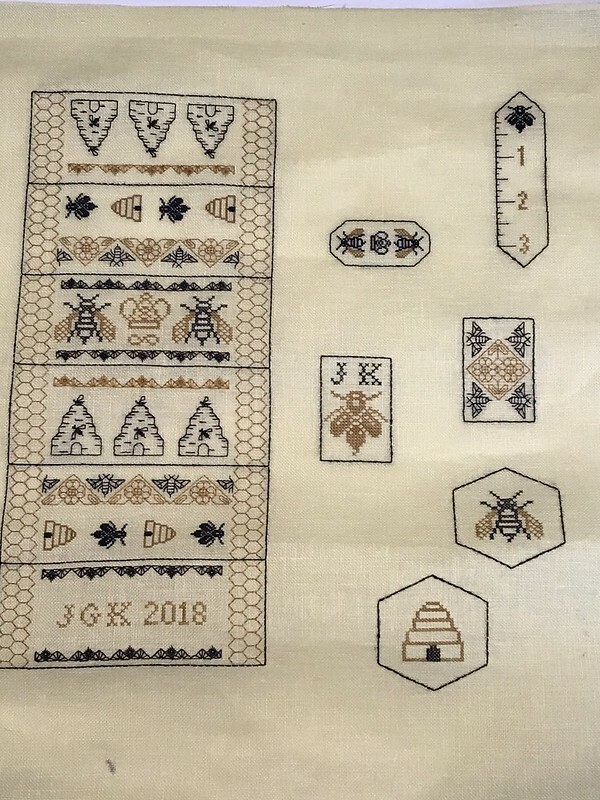 I know I'll get through it at some point and hopefully I'll grow as a queen stitcher because there are other rows of queen stitches in this sampler! I found a very bad photo of the antique. It was sitting in a window where the light was coming from the rear. 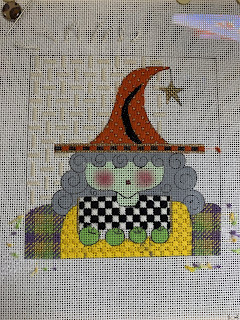 I've also been working on Curly Witch from a class with our EGA chapter in 2018. I've really enjoyed this so far. It's the first time I've stitched a plaid and I'm happy with how it came out. I've got a fair amount of work left to do but I'm sure I'll get it finished at some point. Things with my stash got to the point where I couldn't find anything. I had kits bagged up but they weren't labeled so what good did that do? Also my charts were in a drawer which meant it was a pain to find anything. So I pulled much of it out of the closet and got to work. The charts are now alphabetized in magazine holders (you can see them in the background) and my kits are in more similar sized bags and are labeled. Here are the labels I'm using. I can reuse them easily. I also bought the binder rings from Amazon very inexpensively. I feel better about being able to find things now. Still lots of work to do in there but being able to find most of what I need is a real improvement! It seems like any stash needs constant maintenance! Remember my dilemma on my last post with the Shutter Green dye lot? A reader sent me her older dye lot of Shutter Green along with a Victorian Motto Sampler thread that she felt was a good match. Here are my two Shutter Greens along with the ones she sent. Can you tell which is which? I don't have her permission to say who it was but THANK YOU!!! I hope all your stitches are happy ones! Hello! I certainly didn't mean to be away so long. No excuses! I have been stitching though. 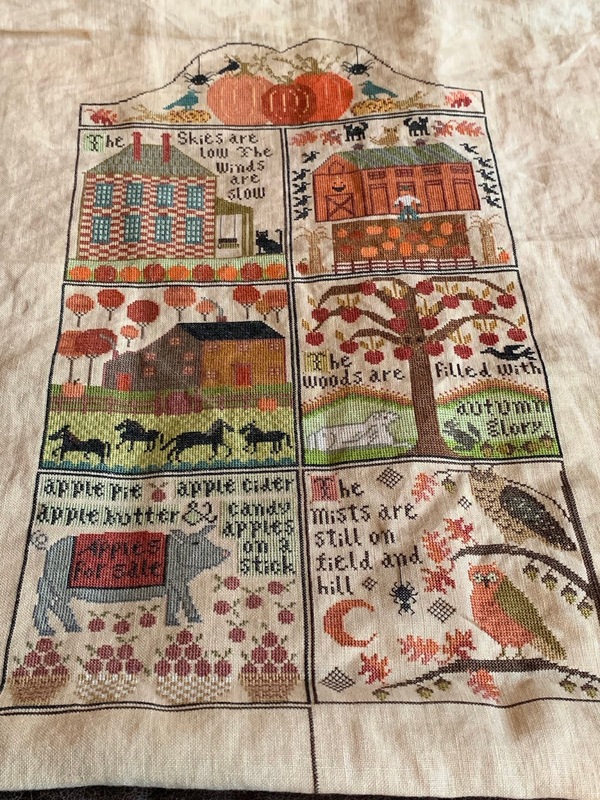 I'll share with you what I stitched on Autumn at Hawk Run Hollow today. 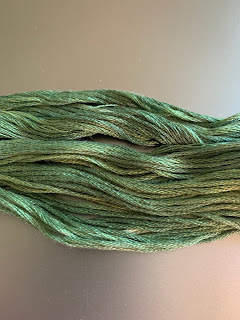 I'm using the called for linen in 40 count and DMC (because there are 60ish colors in this one). This is block 5. Probably my least favorite block though I could not tell you why. I apologize for the wrinkles. More recently I've finished block 6. This one went really fast for me. I just love the spiders in this piece. They really seem to add interest and capture my eye. This block has one spider. I stitched him very last. Here is a picture of where Autumn at Hawk Run Hollow is to date. I've taken to stitching the outline of the next block before I put this project away. That's what you see happening in block 7. I haven't started stitching the interior of the block and for now, I'm putting this one away. 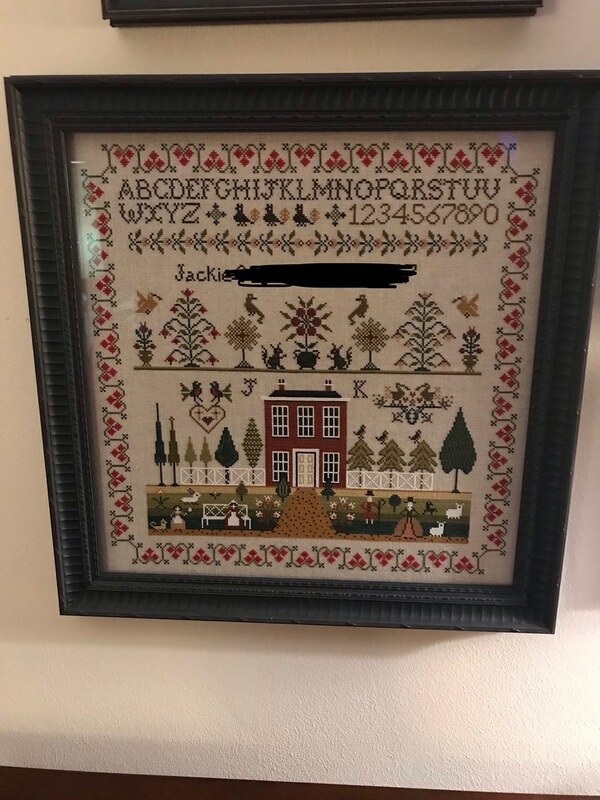 I'll be happy I stitched the border already when I take it back out to work on. I'm working on gathering my supplies for And They Sinned. 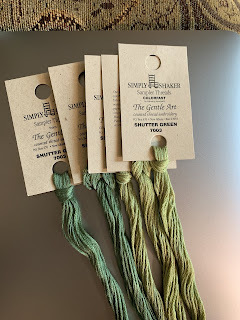 While I had almost everything threadwise in stash, I didn't have 3 skeins of Shutter Green, I had two. So I ordered 3 more because I wanted to dye lot to be the same as this color is used in a very large area (the grass at the bottom). I didn't expect such a significant difference in the colors. They don't even look anywhere near the same color! Better safe than sorry. If anyone runs out of an older dye lot of Shutter Green, let me know! I hoping to get back to posting on somewhat of a monthly schedule. I enjoy the interactions and sometimes I just need to say more than Instagram allows. Thank you for sticking with me during my silent periods. You inspire me so much and I love visiting your blogs too if you have them! Happy Spring! May all your stitches be happy ones! My EGA guild was selected to pilot Betsy Morgan's new teaching piece called Bee Contained. It was such a privilege and obviously we were all thrilled. Being a pilot class comes with responsibility. 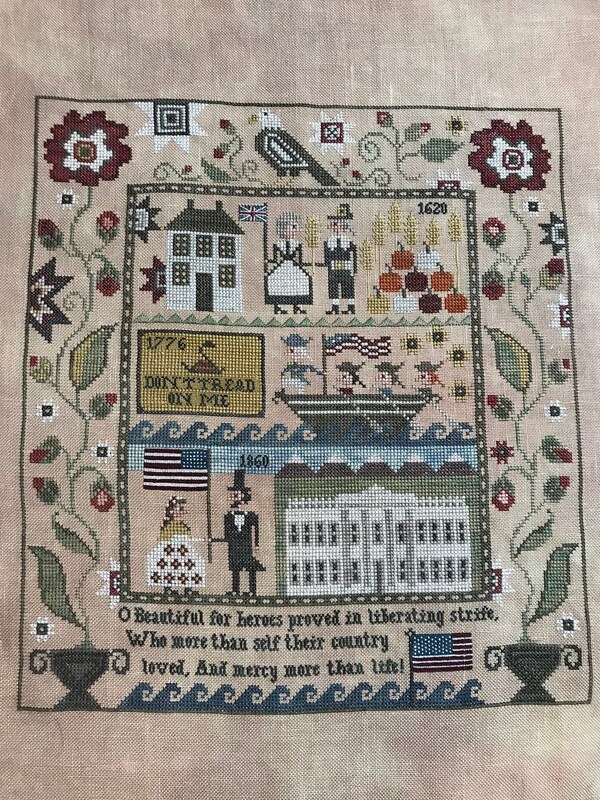 As a result, I worked hard to clear some stitching from my schedule so I could devote plenty of time to stitching this project. You know, instead of just putting the project in stash for a while to marinate. Hopefully I'm not the only one who does that! Being a pilot class entails giving Betsy feedback on such things as the pacing of the class, her presentation, the stitching charts and instructions as well as the quantity of threads, etc. Betsy is an established and seasoned designer and teacher. Everything went so well so the major item to give feedback on after class was the charting/instructions and threads. 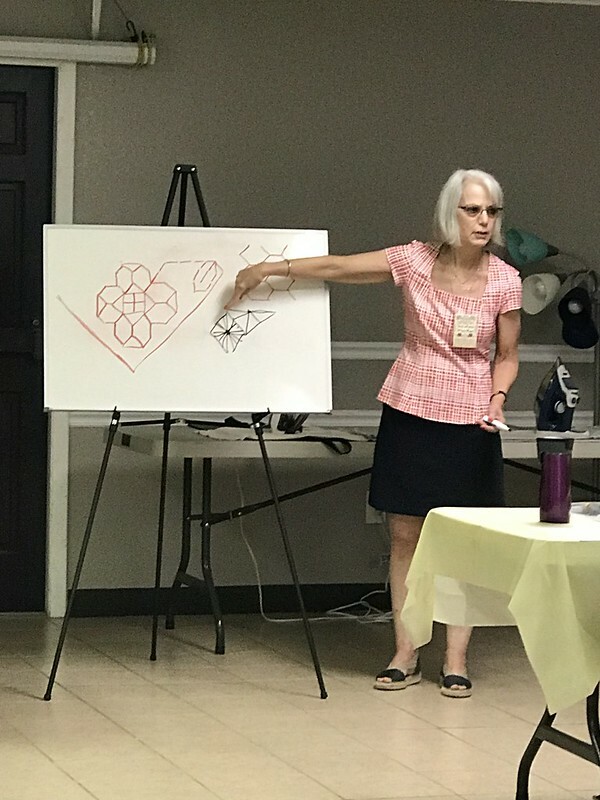 Betsy demonstrating the blackwork path. This is the primary piece to Bee Contained. This is Betsy's model. It's so cute and Betsy's kits are full of high quality materials. This class will be offered beginning 2019. 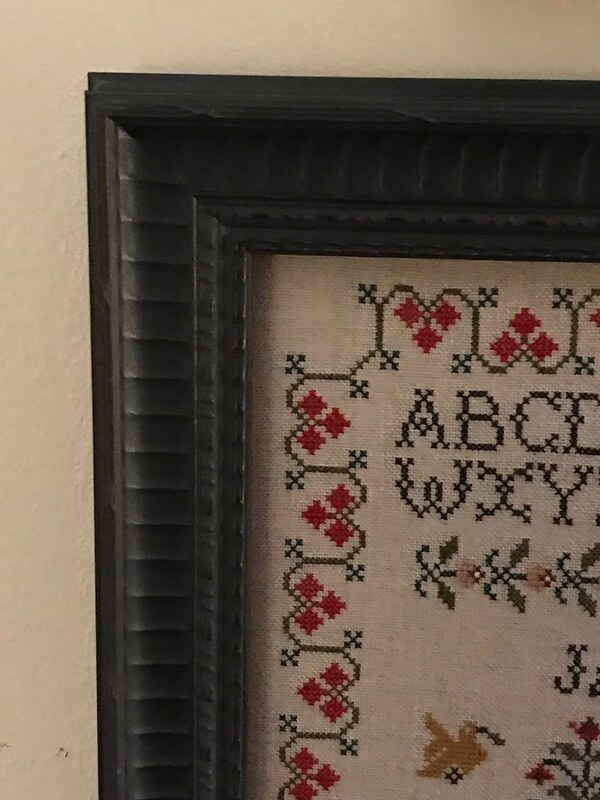 The linen color here is more true to color than the photo of my stitching. 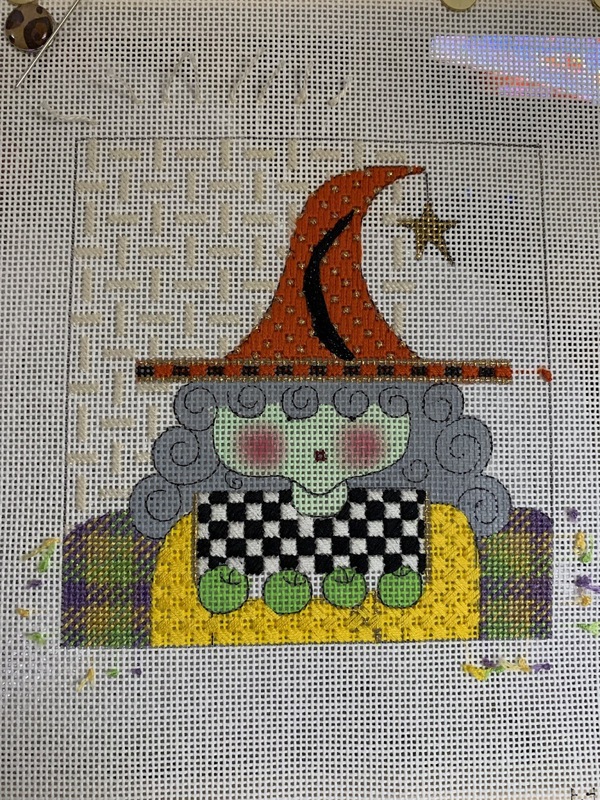 Here is my finished stitching of the class pieces other than the piece we assembled in class. As a pilot class member, we were not required to assemble the project as part of our feedback. I'll probably end up doing that next year. Once the main panel was stitched, it went really, really fast. I left class confident that I could assemble the project on my own which was a real plus and not always the case! This isn't a good photo but this is the piece we completed in class! It's so cute. So cute that my dog Murphy is super interested in it every time he happens to see it! It's a good thing I'm always careful with my stitching around him! 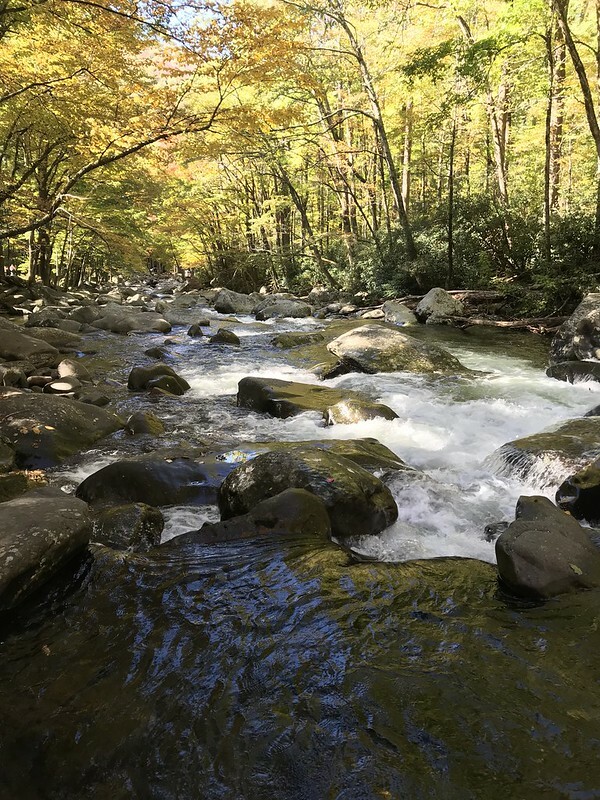 Longtime readers of the blog will recall that Greg and I typically vacation in the Smokies every fall. This year was no exception. Living in Florida, we get zero fall color. Our trees typically go straight to brown from green. 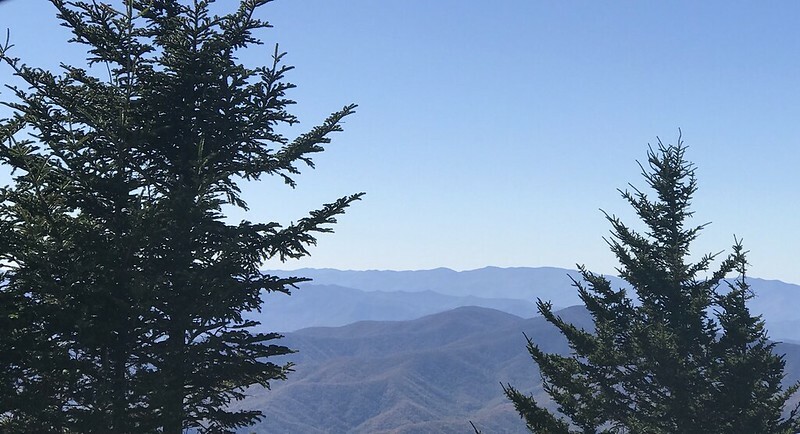 I think this is our 9th or 10th year visiting the Smokies in October or November. The last several years we've gone with dear friends. We love visiting the mountains (any mountainous area really). I think with views like this it's understandable why this is our happy place! Hoping all your stitches are happy ones! I've had a chance to get some projects framed. They've been hung too after a couple of weeks of hanging out in my sewing room. First up is this Brenda Keyes piece that was a SAL with my EGA chapter. 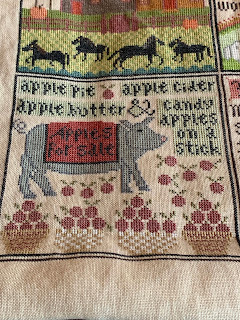 You can find my details on this sampler HERE. 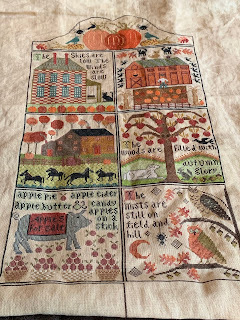 It's called Country House sampler and I fell I love with it when Tanya from The Scarlet House posted her version on FB. 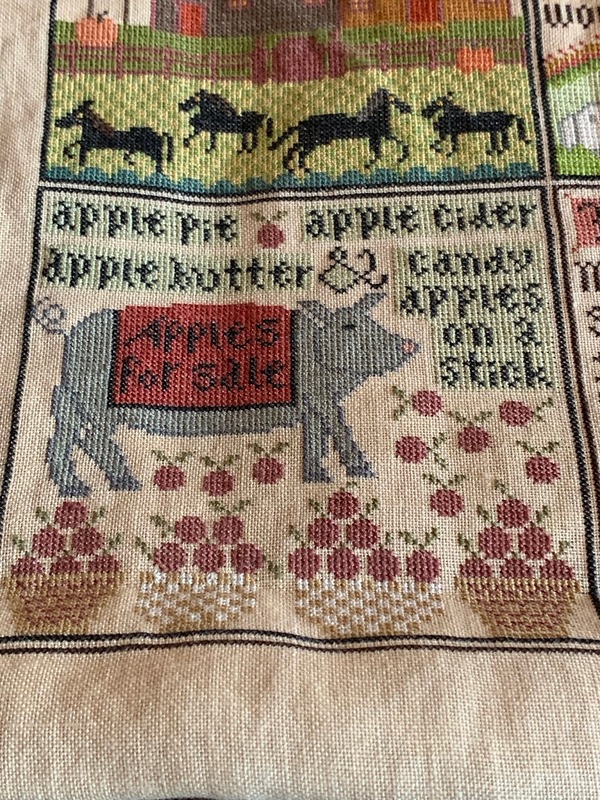 It was in a grouping of sampler pics and she graciously gave me the information. I personalized this one with my name which is why you see the black blob. 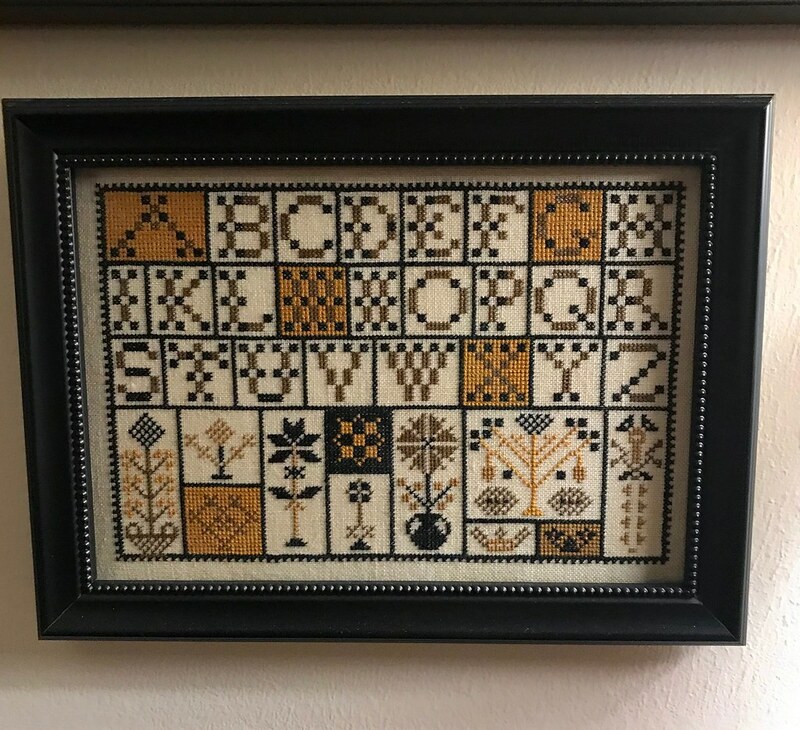 This one is A Pennsylvania Alphabet by the Goode Huswife. This is not one that Anne has reprinted as yet and is rather hard to find. Thanks to a generous friend who lent me her copy! You can find my details on this project HERE. I did change the thread colors. This project is special in that it saved my sanity when my dad fell and had surgery/was in rehab. Every stitch was stitched at his hospital bedside or with my mom who has dementia. It was a long and stressful 2 months but I was blessed to spend time with them and help take care of them. Do you have any projects that take you back to a specific time in your life or to a certain event? The close ups of the frames indicate a good dusting is needed! If I do that and retake the pictures, this blog post would never get made. Ever feel that way yourself? We had a great Thanksgiving and I hope you did too! May all your stitches be happy ones! I hope you're having a great summer. It's been hot here with a LOT of rain. No water shortage here for sure. Fall still feels like a long way off but I'm ready for it to cool down drastically. 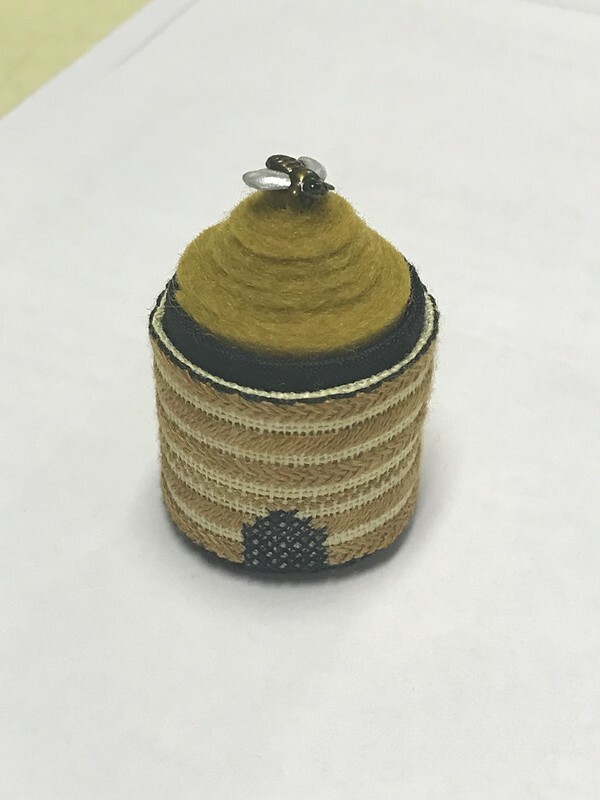 I've been absent from the blog but I have been stitching! I finished up Heritage Sampler from Plum Street Samplings. I fell in love with this when I saw Paulette's video that explained what each quadrant meant and shared insights into her design process. 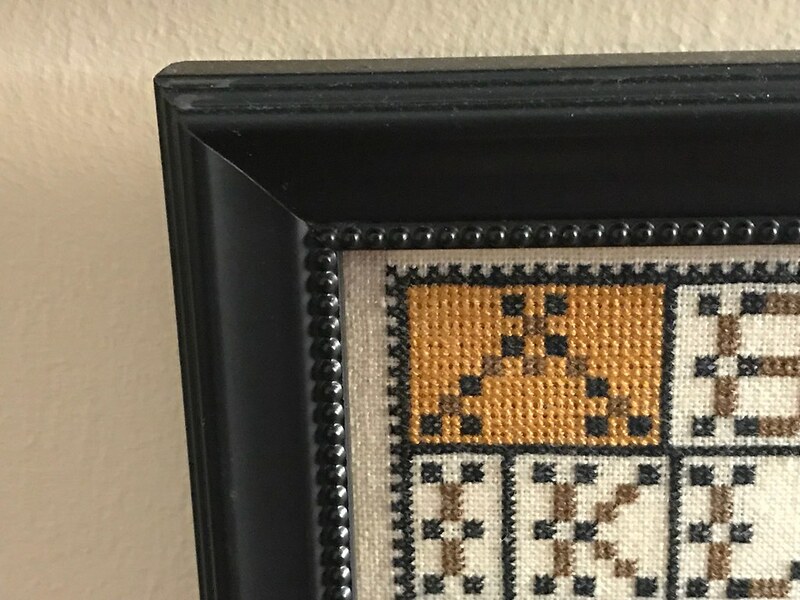 I really enjoyed stitching this and learned that when the designer suggests half crosses on certain over 1 sections that it a good idea to NOT decide to do full cross! I'll be back soon with more! I hope all your stitches are happy ones! Discovering my creative side! I started knitting in January 2008 and took my first quilting class October 2008. I started stitching in late 2009 and have an interest in wool rug hooking. After years of thinking about the things I wanted to learn to do, I decided it was time to get busy actually doing it!